The new Potable Aqua Pure Electrolytic Water Purifier is the smallest and most cost effective water purification device on the market. Using a simple brine (salt + water) solution, the PA Pure device produces a powerful mixed oxidant disinfectant capable of purifying even the dirtiest of water. 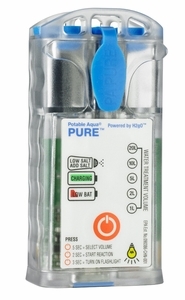 Great for campers, hikers, militaries, emergency organizations and anyone needing drinkable water, Potable Aqua Pure inactivates viruses,bacteria, Giardia and Cryptosporidium killing 99.9% of all organisms without the need to pre-filter or pump. Broad Spectrum Kill:Purification with mixed oxidants results in a broad spectrum kill of viruses, bacteria, and protoza - making water bacteriologically suitable to drink. PA Pure produces a mixed oxidant solution of Chlorine and Peroxide for more potent disinfection. Unlike UV light, which requires pre-filtration to guarantee inactivation of all microbes in very cloudy water, PA Pure mixed oxidants can inactivate microorganisms in all types of water with no pre-filtration. Residual disinfect prevents biogrowth in stored water for long-term use.